Hand carved Four Seasons statues in natural stone. Spring is shown with profuse flowers because it is the season when most flowering plants blossom. Summer holds a sheaf of wheat and wears a cloth headband to illustrate the labour and product of the wheat harvest, which is done in the summer. Wheat can either be planted in the winter to be harvested at the begging or very end of summer, respectively. Autumn is the season in which most fruits become ripe. Since grapes are harvested in the fall, wine also is made in the fall. This is alluded to by the goblet. Winter is shown without produce and striving to warm himself because the temperate winter is cold and rather. 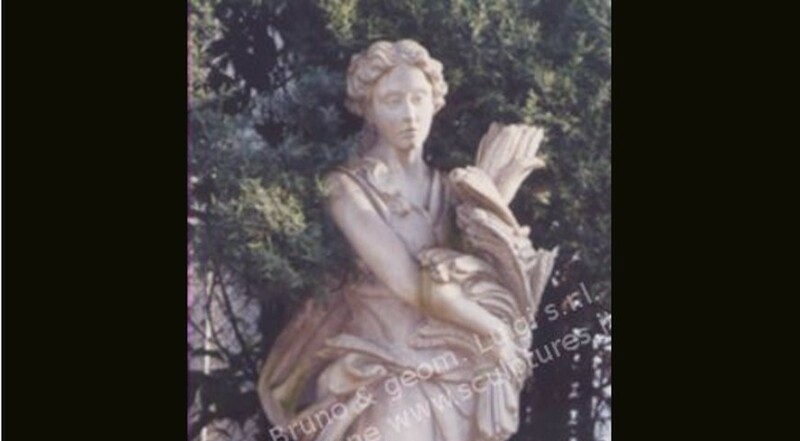 A lot of Seasons statues were designed by Andrea Palladio, he used several statues in the Villa's. Around Veneto area, Venice, Treviso and other places all the parks have these type of hand-carved sculptures. Landscape architect and garden designers use today these nice elements on the private Residence parks. This classic style statues are hand carved in our Firm from our sculptors with the antique tradition of the "scalpellini". The Marinali school is other important influence for the statues placed on the top of Villa. See the images on the roof of Villa La Rotonda in Vicenza, the particularity of the carved sculptures in Vicenza stone are also all around the large park on the little green hills.